Retail sales only, subject to availability for vehicles registered between 18.12.18 and 31.03.19 at participating dealers. T&C apply. ~0% APR and *4.1% APR Mazda Personal Contract Purchase available on all new Mazda models. At the end of the agreement there are 3 options: (i) Part exchange the vehicle. (ii) Pay the Optional Final Payment to own the vehicle or (iii) Return the vehicle. Further charges may be made subject to the condition or mileage of the vehicle. Finance subject to status, 18s or over. Guarantee may be required. Mazda Financial Services RH1 1SR. Channel Islands and Isle of Man excluded. Not available in conjunction with any other offer unless specified. We are a credit broker not a lender for these financial promotions. We can introduce you to a limited number of carefully selected finance providers and may receive a commission from them for the introduction. ^T&C apply. Retail sales only at participating dealers. 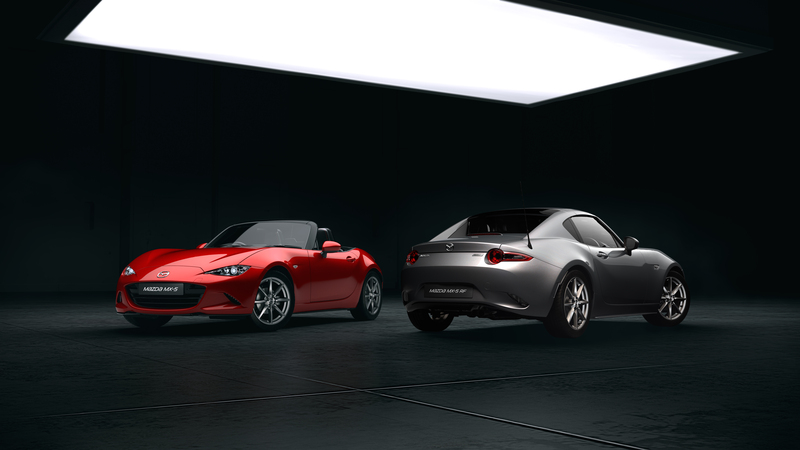 Fixed price servicing of £299 on Mazda MX-5 applies to the purchased vehicle only and is not transferable. Correct service intervals should be maintained in line with the Mazda service schedule. Services not carried out within 90 days from the service due date can no longer be claimed and will not be refunded.